Emperor Echo is the newest member of Emperor Fleet in Egypt. Yacht provides high-quality services for a smart price. All park fees and taxes are already included in the price, you don't have to pay extra money during the trip. Advanced divers can use nitrox on the board free of charge. The boat is friendly for non-divers, they can rent snorkeling gear for free and a get a €35 voucher to spend on board. 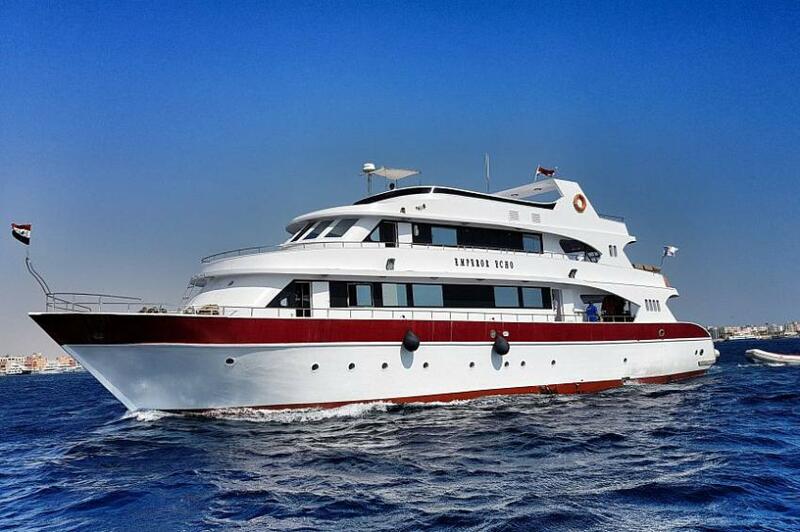 Emperor Echo has 13 cabins on the board that can accommodate up to 25 passengers. 8 staterooms are located on the lower deck. 6 of them has twin beds and suits for sharing, 2 cabins equipped with double beds. 4 rooms with twin beds placed on the upper deck. All cabins on the board of Emperor Echo are ensuite and has air conditioning. Stateroom also supplied with towels and bathrobe per guest. The boat has an indoor salon with air conditioning and entertainment system. It’s great to spend time in between dives. There is also a spacious shaded outdoor lounge area on the upper deck with cushioned sofas. Emperor Echo’s guests can relax in the open air. Diving deck of Emperor Echo is spacious enough to make preparation for diving comfortable. It is equipped with storage boxes for the gear, 12 and 15 l tanks. All diving gear can be rented with a prior notification. Emperor Echo supplied with 2 air compressors and 2 nitrox membranes. The boat offers special facilities for marine photographers. There are a separate camera preparation area and a rinsing tank. Emperor Echo has all the necessary navigation and safety facilities including GPS and Echo Sounder, VHF Marina Radio, Satellite Phone, emergency rafts and life vests. Emperor Echo’s itineraries include all the best of Red Sea. You can choose what you like the most explore wrecks or dive at Marine Parks of Egypt. Northern itineraries include diving at famous sunken ships of Egypt - Thistlegorm and Abu Nuhas ship cemetery. Divers will get a chance to discover ar Brothers Islands, Daedalus, and Elphinstone. Emperor Echo offers special trip dedicated to diving with sharks. Spring and Autumn can be considered as the best diving season for diving in Egypt. The weather is not too cold or too hot at this time. May and October are good for diving with sharks. The diving trip was good overall with couple of exceptions. There was a consistent problem with the boat generator resulting in poor air condition in the dining room and some nights in the sleeping cabin. The rental equipment has no alternative for unfit item. My rented mask had foggy problem but no substitute was available, but fortunately DM Robertu(very good DM) lent me his personal mask to replace the problem mask.